There were many parties and balls during the visit of the Princesses of Coburg, among them a grand masked ball at court, memorable for Grand Duchess Elisabeth because it was the first occasion on which the Empress ever expressed displeasure with her. The famous Mme Le Brun had only just arrived in Saint Petersburg. The costumes in her portraits and history pictures had caused a revolution in taste. That of the antique began to take root and Countess Chouvalof [Elisabeth Alexievna!s lady in waiting], capable of a youthful infatuation for anything new and foreign, urged the Grand Duchess Elisabeth to let Mme Le Brun dress her for the masked ball .... The Grand Duchess willingly pnd thoughtlessly accepted, without considering whether this would please the Empress or not, and trusting that Countess Chouvalof would propose nothing which could displease Her Majesty. The costume which had been designed and executed by Mme Le Brun was finished, the Grand Duchess appeared at the ball, very pleased and thinking only of the success her costume would have. The different courts went separately to balls of this kind, which meant that Grand Duke Alexander and his wife had been there a long while when they met the Empress for the first time in one of the rooms. The Grand Duchess Elisabeth approached her to kiss her hand, but the Empress stared at her without speaking and did not extend her hand, which both struck and distressed the Grand Duchess. She could well imagine what had provoked this harshness and regretted how easily she had allowed herself to be persuaded to pay her tribute to the latest folly. The next day, the Empress told Count Saltykof that she had been unhappy with the Grand Duchess Elisabeths costume and she continued to treat her rather coldly for two or three days. (Countess Varvara Nicolaevna Golovine, Souvenirs Paris, 1910, pp. 106-107). Identification of this young woman as Varvara Ivanowna Ladomirsky Narychkin (ca. 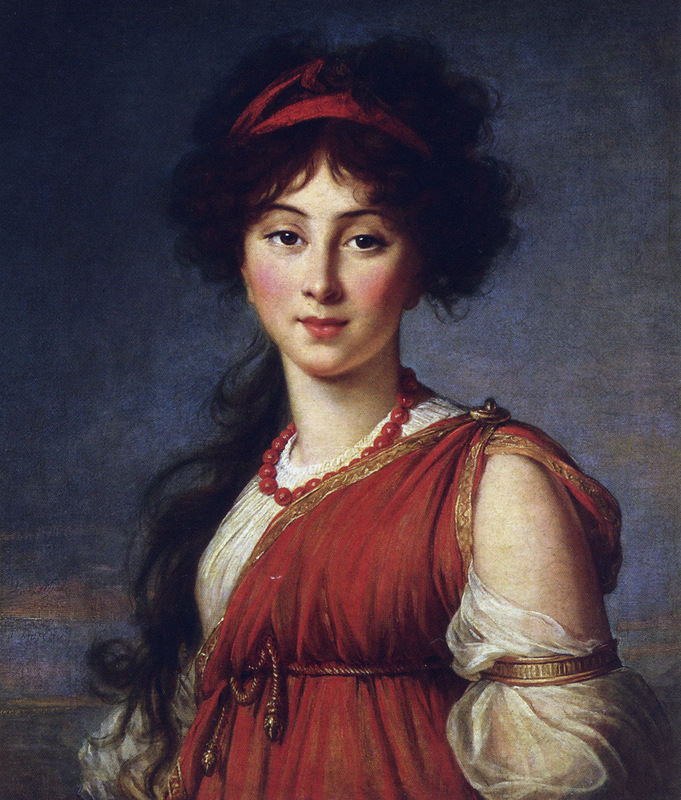 1779-1840), is firmly established in the 1870 Lusheff album, cited below, yet for many years the sitter was erroneously thought to be Princess Tufiakin, whose name was gleaned from the text of the artist's Souvenirs (Vigee Le Brun's portrait of Princess Tufiakin depicted as the goddess Iris is unlocated), and as Maria Antonovna Narychkin, nee Princess Tchetvertinsky (1779-1854), the mistress of Alexander I. Substantiation of her true identity allows clearer understanding of the unusual origins of the portrait. Her mother was Catherine Petrovna Stroganoff, nee Princess Troubetskoy (1744-1815), the estranged wife of the Director of the Academy of Fine Arts in Saint Petersburg, Count A.S. Stroganoff. Her father was Ivan Nikolaevitch Rimsky-Korsakoff, one of the many lovers of Catherine the Great. The Empress banished the Countess and Rimsky-Korsakoff from court upon discovering their clandestine love affair. From Saint Petersburg, the pair retreated to Moscow where they lived in luxurious exile in the Stroganoff Palace and at the Countess's estate of Bratzeva. Varvara Ivanovna was a love child of this union. In 1798, Paul I issued an ukase granting her and her brothers and sister-Vladimir, Basil, and Sophia -the right to bear the name of an extinct noble Polish family, Ladomirsky. Varvara Ivanovna would later marry Ivan Dimitrivitch Narychkin. When Mme Le Brun journeyed to Moscow in late 1800, she took up temporary lodging in a house belonging to Countess Stroganoff (see Appendix IV). This portrait of her young daughter was the only payment the Countess would accept from the artist as rent (Souvenirs, III, 55-56). As of 1980, a copy of the portrait was in the collection of Yuri Borisovitch Schmaroff, Moscow. PROVENANCE: A. Couteaux, Paris; Boris Serguyeff, Wildenstein, New York; acquired in 1948 by Oscar B. Cintas, Havana; Cintas Fellowship Program, Institute of International Education, New York; sold, New York Parke-Bernet, Oscar B. Cintas Sale, May 1, 1963, lot 21 and acquired by Columbus Museum of Art. SELECTED REFERENCES: Souvenirs, 111, 55-56, 61 (not mentioned in the artises lists); Vigee Le Brun, [18291, p. 479; A.M. Lusheff, Historical Album of Portraits of Famous Russians from the XVIth to the XVIlIth Century (text in Russian), Saint Petersburg, 1870, no. 396, illus. ; Nikolenko, 1967, pp. 94-95, 98, 106, no. 19, fllus. ; Columbus, Museum of Art, Catalogue of the Collection, Columbus, Ohio, 1978, pp. 121-122, illus. (with bibliography and exhibition history); G. Greer, The Obstacle Course, New York, 1979, pp. 81, 342, note 27.